Bu çalışmanın amacı Türkiye'de yetiştirilen farklı frenküzümü çeşitlerinin rutin, protocatechuic, catechin, p- hydroxy benzoic, chlorogenic, caffeic, kuersetin, luteolin, kamferol, p-coumaric, vanilin ve ferulic asit içeriklerinin belirlenmesidir. Kırmızı ve siyah frenküzümü çeşitleri (Goliath, Red Lake, Rovada, Rosenthal, and Booskop Giant) ters fazlı yüksek performanslı sıvı kromatografisi kullanılarak fenolik asit içeriklerini belirlemek için analizleri yapılmıştır. Sonuçlar p-coumaric asitin (1.66-0.04 μg g-1) frenküzümü çeşitlerinde baskın fenolik asit olduğunu göstermiştir. Ayrıca frenküzümü meyvelerinden elde edilen ekstraktlardan elde edilen diğer sınuçlarda rutin (35.41-7.23 μg g-1), protocatechuic (3.28-2.84 μg g-1), chlorogenic (65.49-2.38 μg g-1), ve kuersetin asit (2.29-1.50 μg g-1) fenolikleri gözlemlenmiştir. 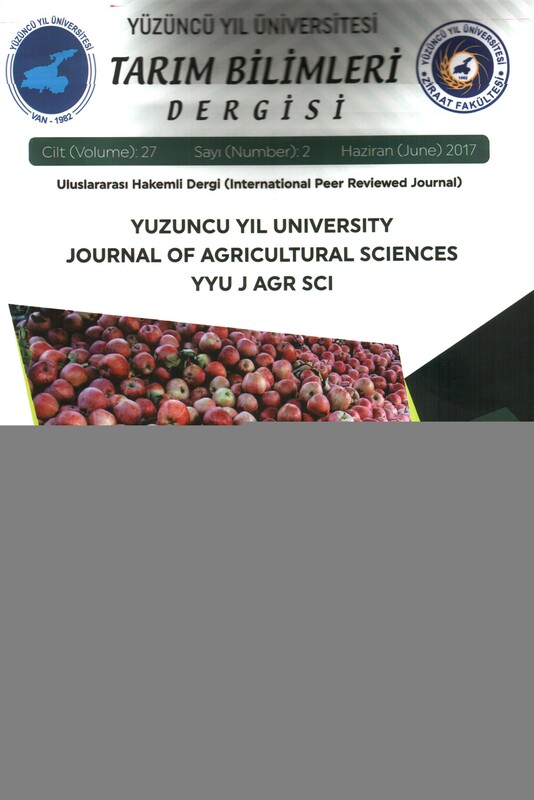 The present work aimed the study of rutin, protocatechuic, catechin, p- hydroxy benzoic, chlorogenic, caffeic, kuersetin, luteolin, kamferol, p-coumaric, vanilin and ferulic acids composition in different currant varieties in Turkey. Red and black currant varieties (Goliath, Red Lake, Rovada, Rosenthal, and Booskop Giant) were analyzed for phenolic acids by using reversed-phase high performance liquid chromatography (HPLC). Results showed that p-coumaric acid (1.66-0.04 μg g-1) was the predominant phenolic acid extracted from currant varieties. In addition, other acids, namely rutin (35.41-7.23 μg g-1), Protocatechuic (3.28-2.84 μg g-1), Chlorogenic (65.49-2.38 μg g-1), and kuersetin acids (2.29-1.50 μg g-1) were obtained in extracts from currant fruit. Benvenuti S, Pellati F, Melegari MA and Bertelli D (2004). Polyphenols, anthocyanins, ascorbic acid, and radical scavenging activity of Rubus, Ribes, and Aronia. J. Food Sci. 69(3): 164-169. Brennan RM (1996). Currants and gooseberries. In: Janick J & Moore JN (Eds.) Fruit Breeding, Vol. II: Vine and Small Fruits Crops. John Wiley and Sons, Inc. New York: 191-295. Caponio F, Alloggio V, Gomes T (1999). Phenolic compounds of virgin olive oil: influence of paste preperation techniques. Food Chem. 64: 203-209. Häkkinen S, Heinonen M, Kärenlampi S, Mykkänen H, Ruuskanen J, Törrönen R (1999). Screening of selected flavonoids and phenolic acids in 19 berries. Food Res. Inte. 32(5): 345-353. Jakobek L, Šeruga M, Novak I, Medvidović-Kosanović M (2007). Flavonols, phenolic acids and antioxidant activity of some red fruits. Deutsche Lebensmittel-Rundsc. 103(8): 369-378. Kris-Etherton PM, Hecker KD, Bonanome A, Coval SM, Binkoski AE, Hilpert KF, Etherton TD (2002). Bioactive compounds in foods: their role in the prevention of cardiovascular disease and cancer. The American J. Medi. 113(9): 71-88. Lin LZ, Harnly JM (2007). A screening method for the identification of glycosylated flavonoids and other phenolic compounds using a standard analytical approach for all plant materials.J. Agricultural and Food Chem. 55(4): 1084-1096. Lin LZ, Harnly JM (2008). Phenolic compounds and chromatographic profiles of pear skins (Pyrus spp.). J. Agricultural and Food Chem. 56(19): 9094-9101. Lin LZ, Harnly JM, Pastor-Corrales MS, Luthria DL (2008). The polyphenolic profiles of common bean (Phaseolus vulgaris L.). Food Chem. 107(1): 399-410. Luthria DL (2008). Influence of experimental conditions on the extraction of phenolic compounds from parsley (Petroselinum crispum) flakes using a pressurized liquid extractor. Food Chem. 107(2): 745-752. Madhujith T, Shahidi F (2009). Antioxidant potential of barley as affected by alkaline hydrolysis and release of insoluble-bound phenolics. Food Chem. 117(4): 615-620. Miguel MG, Neves MA, Antunes MD (2010). Pomegranate (Punica granatum L.): a medicinal plant with myriad biological properties. A short review. J Med Plant Res 4:2836–2847. Mitchell C, Brennan RM, Cross JV, Johnson SN (2011). Arthropod pests of currant and gooseberry crops in the U.K.: their biology, management and future prospects. J. Agri . Forest. Ent. 13: 221-237. Naczk M, Shahidi F (2004). Extraction and analysis of phenolics in food. J. Chromat. A. 1054(1): 95-111. Robbins RJ (2003). Phenolic acids in foods: an overview of analytical methodology. J. Agri. and Food Chem. 51(10): 2866-2887. Søltoft F, Hammer M, Kragh N (2009). The association of body mass index and health-related quality of life in the general population: data from the 2003 Health Survey of England. Quality of Life Rese. 18(10), 1293-1299. Viuda-Martos M, Fernández-López JA, Pérez-Álvarez J (2010). Pomegranate and its many functional components as related to human health: a review. Compr Rev Food Sci Food Saf. 9:635–654.